I just received my 1.1 BCL Russo yellow line pair in the mail from Scott Miller. I'm very excited to watch these two grow and change. I will keep this thread updated as I take pics of them. These were born on July 1st 2018. Below are my crappy cell phone pics of them right after unboxing. 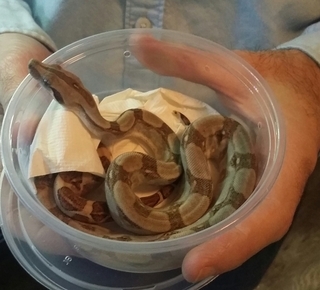 They made the trip great and are already curious and exploring..There wasn't even any hissing when I unboxed them. I totally agree.. I'm looking forward to seeing how they develop. Scott sent me pics of the parents. The mom is super clean, but with ligther markings, the dad is super dark and has a lot of pigmentation in his background color, similar to the look of the hypermel anerys I've seen. Scott said that the female should stay very clean.. The male I picked for contrast (darkest markings) but he'll probably also end up with a lot of background pigmentation like the father. I wasn't prepared for how tiny these guys are. 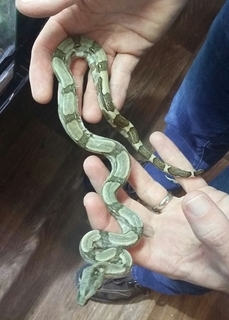 All of my previous boa purchases have been with older animals (1-2.5 years old) so these guys feel very tiny and fragile to me. I will be attempting a feeding this Friday, so we'll see how that goes. So awesome, congratulations. Very happy for you. Best of luck! I asked Scott about what feeding regiment would be best for them and he said weekly to bi-weekly, watching out for constipation. I am on the fence about whether or not I should wait for them to poop between meals. At this point it's been 1.5 weeks since they last ate, so I'm sure feeding will go well Friday. I may start off with a smaller meal than they should be eating just in case. They are on small mouse hoppers right now, but I have mouse fuzzies as well, so I'll just have to find something the right girth. Their bodies are about the circumference of a woman's pinky finger now. I got a male Kenyan sand boa from Scott also and they are basically the same body size as the KSB currently.